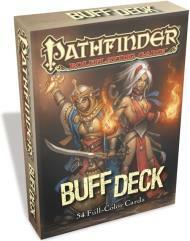 Track your hero’s most important status effects with the Pathfinder RPG Buff Deck! Speed up play and cut down on rulebook consultation by stacking bonuses one on top of another, displaying the effects for each with this easy-to-add format. From spells like bless, haste, and prayer to class features like inspire courage, the 54-card Buff Deck puts all the details at your fingertips, leaving you to concentrate on smiting your enemies!